During Medica.de, the medical technology trade fair in Düsseldorf Germany held in November from 16 to 19, MIC Torino, represented by Khalid Charqane, and other partners presented a preview of the Medical Intelligent System Proof Of Concept. This concept shows that it is possible also in the medical area to integrate separate technological islands into comprehensive integrated systems. The Windows Embedded operating system plays the key role in the Medical Proof of Concept scenario. 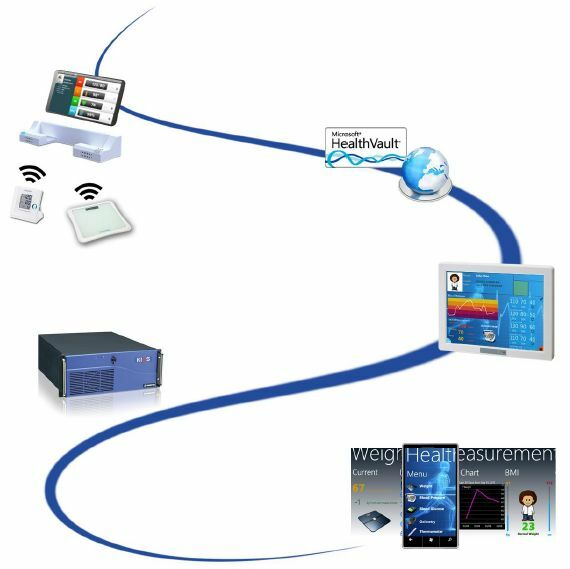 The different Windows Embedded versions offer the common basis for medical end devices, communication systems, mobile technologies and Cloud based solutions. The “Medical Proof of Concept“ scenario provides a number of devices and communication technologies which are specifically developed for the medical industry integrated within one system. It allows to connect different environments and demonstrates how patients can be monitored at home. This leads to an increased quality of life for the patients while simultaneously reducing time and costs of medical care. By using common communication ways, the measured health data are transferred to the “Home Health Hub”, a type of health center for private households. The weighing machine and the blood pressure measuring device transfer the values via the medical communication standard named ZigBee. The blood glucose measuring device communicates via Bluetooth SPP and the thermometer by using Bluetooth Low Energy. The hub bundles, converts and sends the data via the internet to the health portal “Microsoft HealthVault”. The patients’ health record, which can be accessed by the treating physician, the caregivers or by the patients’ relatives, is maintained in the Cloud based solution. The role of the Microsoft Innovation Center was to provide the health data maintained in Microsoft Health Vault to physicians and caregivers in an appropriate form – which means quickly, in a precise and intuitive manner, by developing a Windows Phone mobile app and a Windows Embedded Standard 7 tablet application which enables physicians to directly access Microsoft Health Vault. This way, physicians can retrieve the health data or save new information, such as diagnoses or reports, just with a few fingertips.